If anyone is paying attention to historical dates in Puget Sound Maritime history, today is the MV ISSAQUAH's 29th Birthday. The ISSAQUAH was "launched" on December 29, 1979. I stood on the First Avenue South Bridge and watched the proceedings. It was, to say the least, a boring one. All six of this class of ferries were built on a flat surface of land on Marine Power and Equipment's premises. The nearly finished vessel was moved to a large lift. The lowering took awhile. The only excitement was a spinning of her propeller. I left afterwards. In the Summer of 1980, she entered service on the Vashon Island run, replacing the NISQUALLY (which went north to join the ILLAHEE and OLYMPIC on the Mukilteo run). Her workmates at Vashon would be the KLAHOWYA and QUINAULT. Disaster struck on December 29, 1980, just after putting the ISSAQUAH back into service after a servicing. This would be her First Birthday. 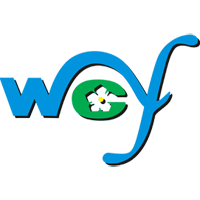 WSF didn't know what to expect from a youngster. SHE CELEBRATED HER FIRST BIRTHDAY BY BASHING UP FAUNTLEROY! The damage was severe enough to send all traffic through Colman Dock. 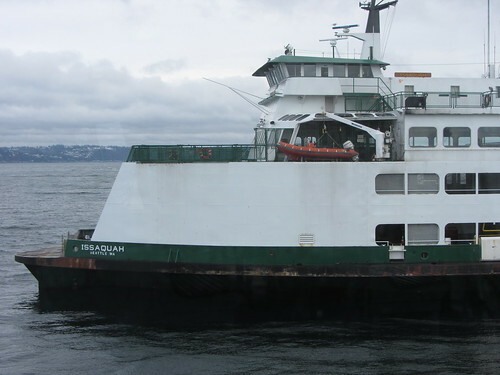 The KULSHAN, which was subbing for the ISSAQUAH, was pressed into service as fourth ferry on the detour, which lasted for about a month or two. WSF engineers were scratching their heads double-time as the newer KITTITAS joined in the bashing party by denting Lofall within hours of the ISSAQUAH's misbehaving, putting the Hood Canal crossing out of service for hours (this crossing was restored after the Bridge sank in 1979). 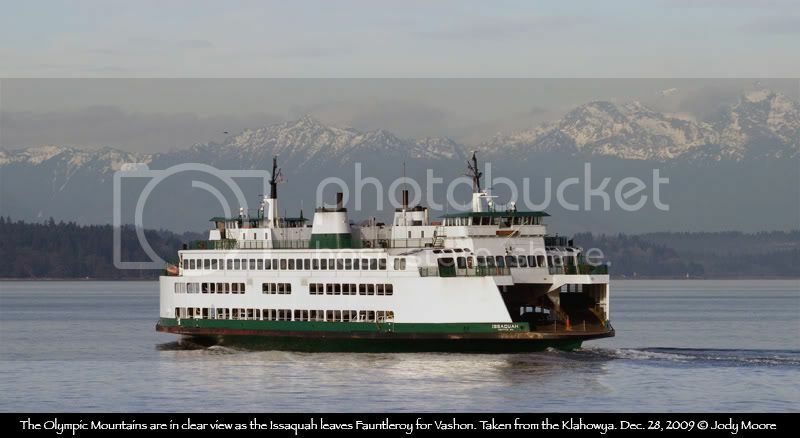 The KULSHAN did work briefly shuttling between Vashon and Southworth as an experiment while letting the main ferries do express trips to Seattle. Alas, short lived as Hood Canal was calling for the KULSHAN's return there (the KULSHAN and TILLIKUM were on the Canal in 1980). The detour had the ISSAQUAH, KLAHOWYA, and QUINAULT. I think I do remember that an eastbound Bremerton super was diverted in the morning to pick up Vashon traffic to Seattle. It's been a bit of normalcy since then, except for a memorable crash on the south slip at Clinton by the CATHLAMET (which resulted in some fabulous photography of twisted mess that was seen in advertisements in maritime magazines). I think there were others, but not as memorable as the ISSAQUAH's birthday bash in 1980. Keep it cool, though. Let's keep traffic moving normally. Sound, Washington during the period of May 3 – June 18, 2010. Everett Shipyard put in the winning bid. she came up for rare weekly visit at Mukilteo / Clinton run. I thought the red and white color scheme was different. Doesn't she have white captain chairs in the end cubicals of the passenger deck ?? Last time she was up here she look like the car decks needed a paint job. What is this red-and-white color scheme of which you speak? The last time I was on the Issaquah she looked like a trial scheme for the Mark IIs. 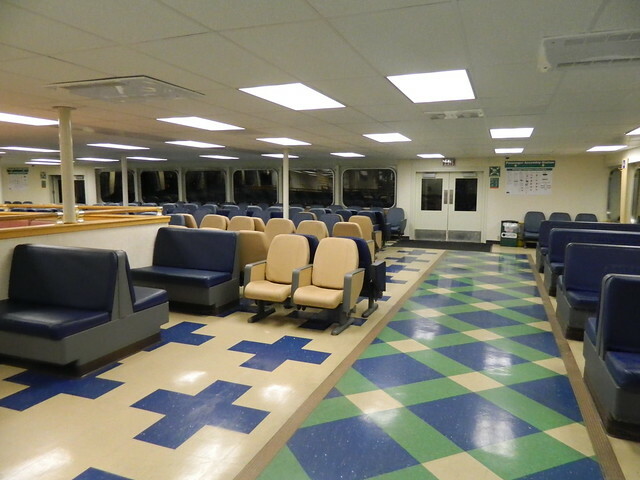 And I'd hope that nobody would be daft enough to put white chairs anywhere on any ferry... they'd be that color for about two crossings. 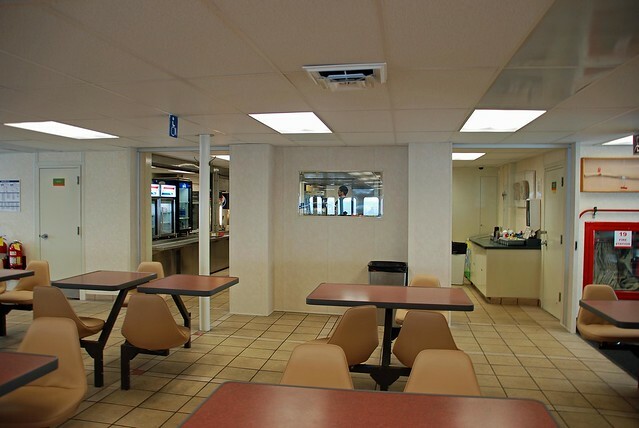 It looks like the "red & white" may be confined to the galley seating, although I think it's more of a beige, like what M/V Tacoma has. Oh, that's red? I thought it was more of a brick color, and beige/almond. But again, I don't think I've worked on the Issy since about 1998. My only objection to this story is it underplays the mechanical failings of these boats when they first came online...blaming part of it on "crew familiarization" is just silly. Those boats would randomly start moving on their own due to the twitchy computers. Until all those early computer systems were ripped out, the problem didn't completely stop. I've got about three reams of paper with stories covering every mechanical maladies of these boats, and they had practically nothing to do with "crew familiarization" or the controllable pitch propellers. Night descended hours earlier, when the weak, winter sun slunk behind the Olympic Mountains. Stragglers wait along Fauntleroy Cove; the afternoon rush ended long ago. The last commuters sit, impatient and weary, in vehicles, sealed behind steel and safety glass. Lines form and vehicles — mud-caked Subaru wagons, worn SUVs with stickers on the rear windows — inch into position. Destination: Vashon Island. The ferry glides into view across Puget Sound. 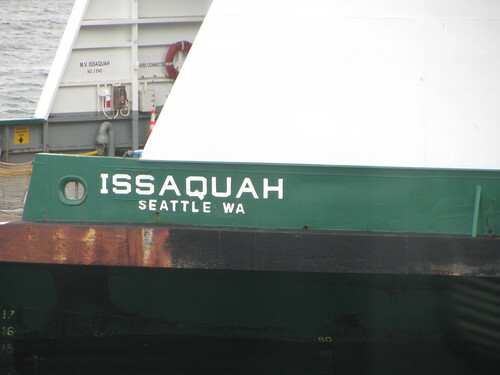 The hull carries the same name as a place 20 miles east: Issaquah. The vessel matters little to the travelers; the Klahowya or the Tillikum could carry them home just the same. Come daylight, the boxy Issaquah looks as unglamorous as a mail truck, with the same work ethic as a letter carrier — neither snow nor rain nor heat nor gloom keeps the ferry idle. Darkness softens the hard edges, and the Issaquah looks handsome, even majestic. Light spills from the oblong windows and the open vehicle deck. Reflections glimmer across the dark water. As the ferry approaches the West Seattle terminal, propellers churn the inky water into foam, like the frothy head on a glass of pilsner. The vessel nudges the dock, the ramp lowers and attendants in fluorescent gear direct vehicles from the maw. Not 20 minutes later, more cars, trucks and SUVs fill the hold. The placid efficiency contrasts with the years in the Carter era when the Issaquah entered service and headlines blared problems aboard — and caused by — the ferry. The ferry, and the other Issaquah-class vessels under construction at a Seattle shipyard in the late ’70s, took a circuitous route from lemon to modern-day workhorse in the state fleet. 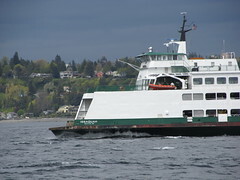 Nowadays, the ferry Issaquah plies Puget Sound on regular runs from the Fauntleroy Terminal to Vashon Island and Southworth on the Kitsap Peninsula. Lawmakers and the builders hurled sharp words at the other in the early days. 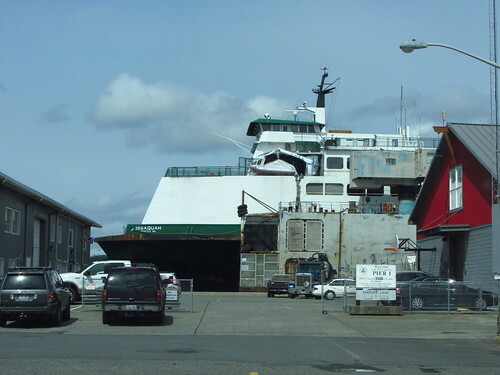 The rhetoric ratcheted higher as Washington State Ferries yanked the vessels from service, inspected and repaired the ferries, only to remove the vessels from service again. Reminders from the contentious early years remain: Crewmembers still refer to the vessels as “citrus class” ferries, a nod to the era when editorial cartoons and T-shirts derided the Issaquah as a proverbial lemon. The vessel debuted with unforeseen mechanical problems, spats between builders and officials, and troublesome safety questions. “My mother would call me up and say, ‘Do you know what you’re doing down there?’” ships superintendent and welding supervisor Ralph Hansen recalled. He worked at the Marine Power & Equipment shipyard, where the Issaquah class vessels took shape. Before the maelstrom — accidents, lawsuits, angry letters to the editor — dignitaries set aside the unease to christen the Issaquah. Townspeople gathered at the Seattle shipyard to watch the ferry ease into the Duwamish River. Historian Harriet Fish walloped a bottle of champagne against the hull Dec. 29, 1979. After the ceremony concluded, the boldface names and Issaquah residents left, and yard workers raised the vessel from the water for some last-minute construction. Not long ago, a class of Port Townsend fourth-graders beat students in Chimacum and Whidbey Island to pick the name for the newest state ferry class: Kwa-di Tabil, or “little boat” in the Quileute language. A celebration followed the announcement from the state Department of Transportation. Next came congratulations from Gov. Chris Gregoire. A commemorative plaque — delivered by the governor — should arrive within weeks. The announcement recalled a push more than 30 years ago to name a vessel after Issaquah. The effort resulted in a ferry class named with words picked from native tongues: Issaquah, Kittitas, Kitsap, Cathlamet, Chelan, Sealth. But the grade-school contest — tied to lessons about Pacific Northwest American Indians and Puget Sound maritime history — lacked the ironclad determination and political maneuvering behind the Issaquah effort. Fish, then the Issaquah historian, spearheaded the endeavor to name a vessel in a planned ferry class for the Eastside city, and shepherded the necessary legislation through Olympia. A Lake Washington ferry from the early 1900s also carried the name Issaquah, and townspeople conceived the drive to name a new ferry as part civic pride, part tribute to the bygone vessel. Supporters marshaled students to collect innumerable signatures scrawled on petitions, City Council members to endorse the effort and residents to sit through legislative committee meetings. For the effort to succeed, city residents had to convince lawmakers to name a ferry for Issaquah. The blitz worked: A state transportation bureaucrat told a Senate committee how he had never seen “such a tremendous outpouring of support” for a ferry name. 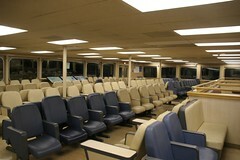 Legislators agreed, and designated the first vessel in a soon-to-be-launched ferry class as the Issaquah. But the rollout of the new class proved nettlesome. Designers included advances — like computer technology and variable-pitch propellers built for maneuverability — in the new ferries. Although engineers hailed the systems as innovative, delays and public squabbles between the shipyard and state officials shoved the superlatives aside. Chuck Fowler served as the state Department of Transportation public affairs administrator in the ’70s. He handled a barrage of questions from reporters asking about the troubles with the Issaquah class. 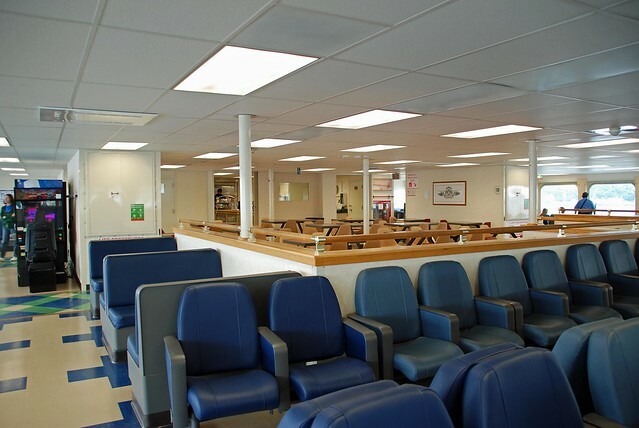 The woes and high-profile missteps drew unwelcome attention to the largest ferry system in the United States. A cruise around Elliott Bay for state dignitaries ended after a gasket blew and the Issaquah limped into port alongside a tug. Accidents and computer glitches plagued the Issaquah-class vessels after the ferries entered service in the early ’80s. The new ferries rammed docks and, another time, a vessel pulled away from a pier, dropping a — thankfully — unoccupied car into Puget Sound. People called the new ferries unsafe. T-shirts emblazoned with “I Survived the Issaquah” appeared. The ringer tees depicted cartoon cars and passengers tumbling into the water, while seagulls recoil from the scene. Paul Zankich often faced a firing line from passengers and the news media back then. He designed the ferries, and served as chief engineer of the Marine Power & Equipment shipyard. “People said I should get combat pay for what I was doing,” Zankich said. Former shipyard workers said some of the snags dissipated as ferry crews acclimated to the new systems. Tweaks ordered by DOT officials helped remedy problems, too. “Once you’re sitting at the helm and the controls are in your hand, that’s where the buck stops,” Hansen said. Midmorning sunshine reveals the Issaquah as a leviathan — brawny and utilitarian, all noise and steel. The deck plates jostle beneath cars, trucks and Metro Transit buses, rumbling aboard in a careful choreography. Day-Glo-orange life rings and Zodiac lifeboats punctuate the hunter-green-and-white color scheme. 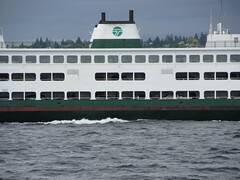 Nowadays, the Issaquah and its five sister vessels serve as workhorses in the state ferry fleet. 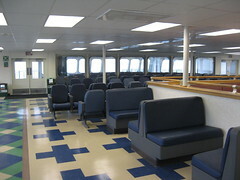 Combined, the ferries haul about 18,500 passengers per day. 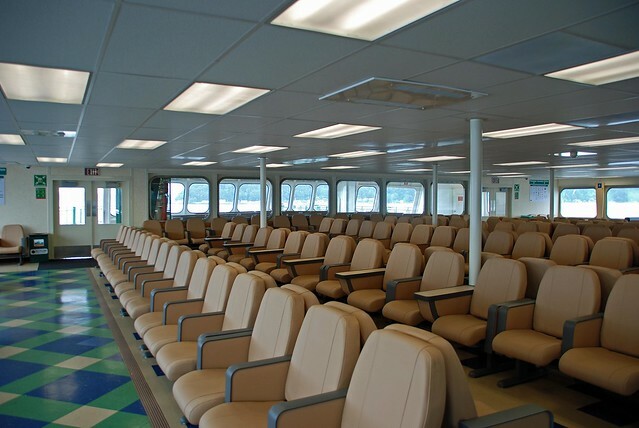 The flagship Issaquah carries 2,751 people each day on trips from West Seattle to Vashon Island to Southworth and back again. Built to carry 1,200 passengers, about 130 vehicles and almost as long as a football field, the Issaquah feels like a lonely place on midday crossings. 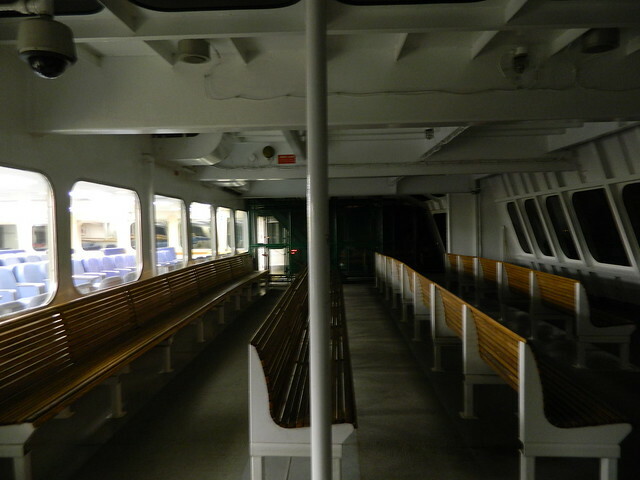 The cavernous passenger deck sits almost empty. 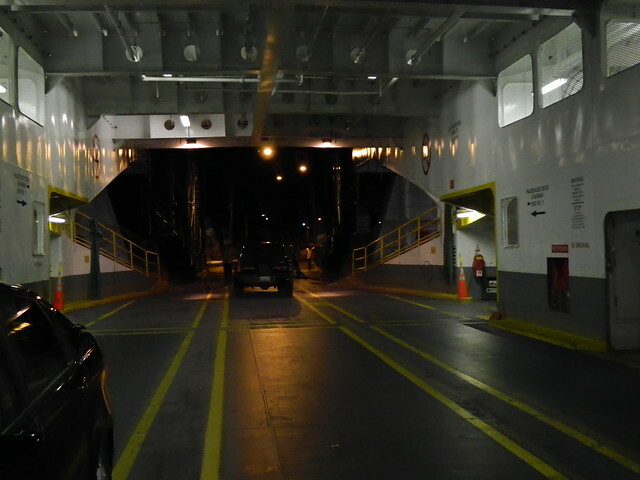 Below, on the vehicle deck, most of the passengers wait in cars, idle and still seat-belted in. Aboard the Issaquah, Boatswain Greg Kruse keeps order on the vehicle deck, where loadings and unloadings unfold in a well-timed blur. “Safety is our biggest concern,” he said during a mid-January crossing. The former charter boat captain wakes on workdays at 3:17 a.m. and leaves home in Ballard to reach the Fauntleroy Terminal by 4:25 a.m. On some days, the job rewards Kruse with postcard-perfect vistas: Mount Rainier to the south, the downtown Seattle skyline to the northeast, the Olympic Mountains to the west. 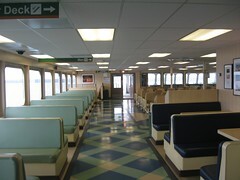 The passengers aboard include former Issaquah Councilman David Kappler, a frequent rider on the ferry. 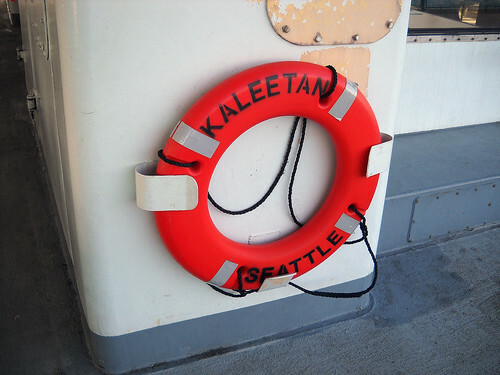 He boarded the vessel on a sun-splashed January day for the crossing to Vashon Island, where he has a house. Kappler left his pickup on the vehicle deck, and then ambled upstairs to the passenger area. The longtime councilman eyed grainy reproductions of historic photographs depicting turn-of-the-20th-century Issaquah. 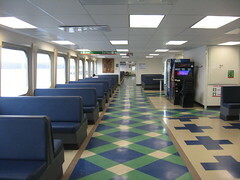 Besides the photos, the ferry contains few connections to its namesake city. Despite dozens of trips to the island, he has never encountered notable, part-time residents Al Rossellini and Booth Gardner — former governors who spend summers there. Capt. 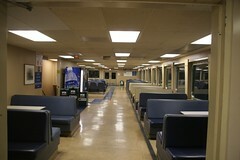 David Wilson joined the state ferry service about the same time the Issaquah-class vessels entered service. On most days, he guides the Issaquah from pilothouses at each end of the ferry. “If you cut the ferry in half, you’d be hard-pressed to know which end is which,” Wilson said. The vessel sails Puget Sound at about 17 knots, or 20 mph. Upgrades, like radar and global-positioning technology, have alleviated some of the navigation concerns about fog and bad weather. “It’s not a real stressful situation like it was in the old days,” Wilson said. The ferry’s design — so maligned when the Issaquah-class vessels entered service — also withstood the wear and tear of the decades. The state even plans to build new 144-vehicle ferries based on the Issaquah-class design. 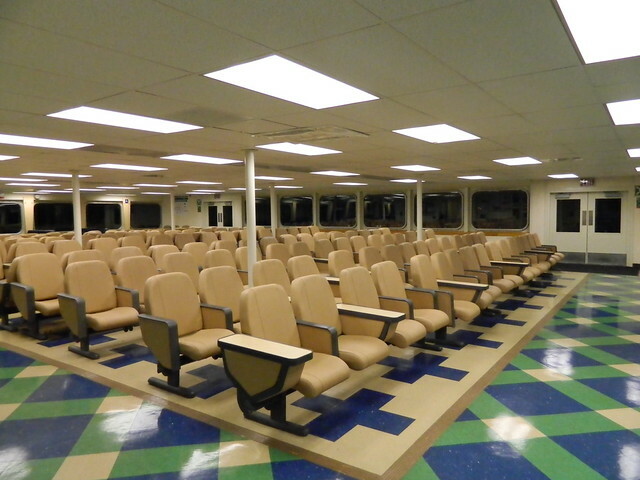 The new ferries could enter service as early as 2014, state budgets permitting. Consider the decision as belated vindication for Zankich, the designer of the Issaquah class and West Seattle resident who lives not far from Fauntleroy Cove. On a clear day, he can look outside and watch the Issaquah sail from the mainland to Vashon Island with workmanlike efficiency. Well, that article is sure a bit of revisionist history. For the record, MP&E didn't design the hull, they got it from the State. Also, everything Zankich designed had to be redone or replaced at great expense to the taxpayer. Yes, it's totally revisionist. 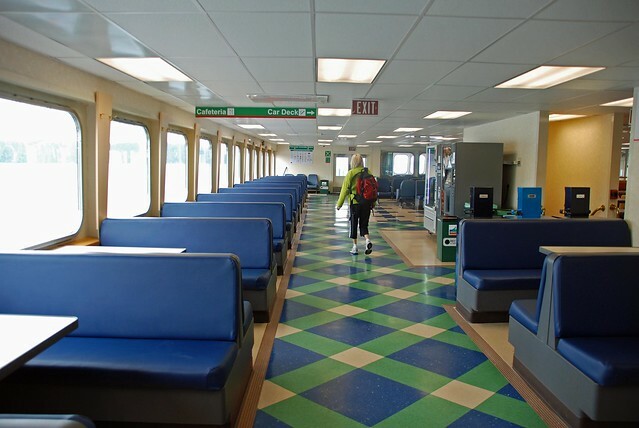 He didn't "design" the ferry; at best, he adapted it from existing plans. The proof of this? I have WSDOT artwork originally billing this group of vessels as the "New Evergreen State Class." For those who have been watching, the Issaquah came back to the Vashon run this AM after spending several months at Everett. 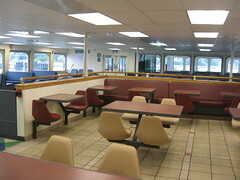 The work included a complete interior renovation of the boat. Anyone heading down that way might want to snap some photos and see what they've done to it. I suspect they got rid of the marmoleum floor tile which I have been advised by many a deckhand is nearly impossible to clean properly. 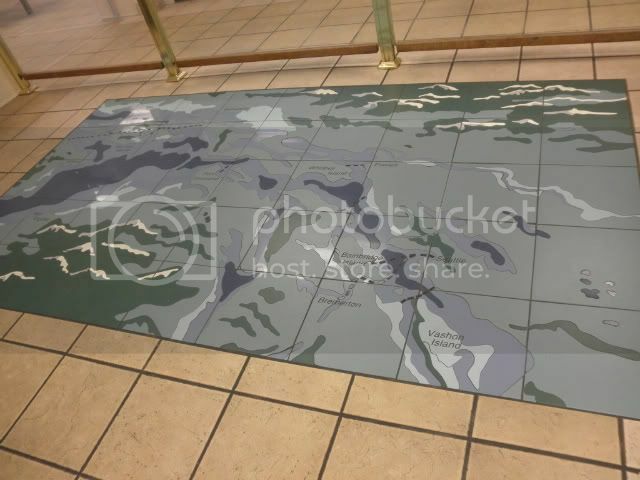 It certainly doesn't hold up as well as the old standard type of tile, and noticed that when they refurbished the Chelan , Sealth and Walla Walla they went back to the old-style asphalt tile. Cool! I'll have to try and get on Issy sometime this weekend. It's been a long time since I have been on that boat. 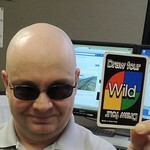 I'll be on the Issaquah this morning (8:00 am sailing). I'll get some pictures. Just received some photos from a friend of the Issy's new interior. Looks good--as predicted, they went back to the old style tile. It's done in dark blue and green ala the Sealth. The light blue upholstry, which has proven to be a bugger to clean, has been replaced with dark blue throughout the vessel. Overall, a nice job! I've got photos! I've got photos! I was on the 12:30 sailing Sunday from Southworth to Vashon. Wow! Thanks for sharing. It looks like they didn't do anything to the galley save for the partition (which I suspect hides the metal curtains for closing time). 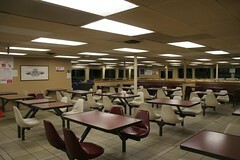 That's okay; the galley on that boat was already beautiful. The rest of the interior... I was surprised to see they re-used the Sealth plaid in the walkways. Initially I didn't care for it but it's grown on me. And no light blue upholstery... YAY! 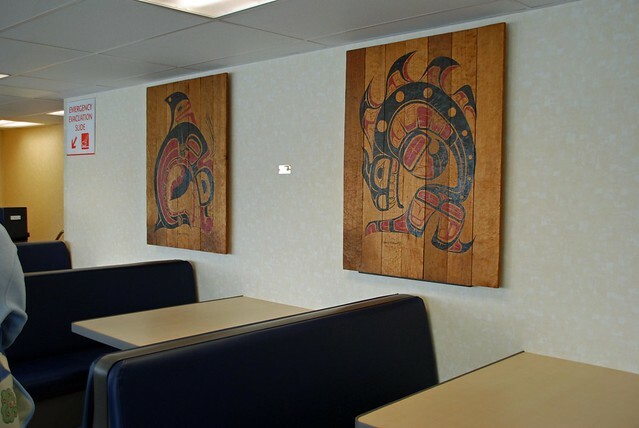 As far as I know the cedar artwork was original to the boat, or very nearly so. Glad to see they're still using it. The plaid flooring really adds some colour and vibrancy to the ship! 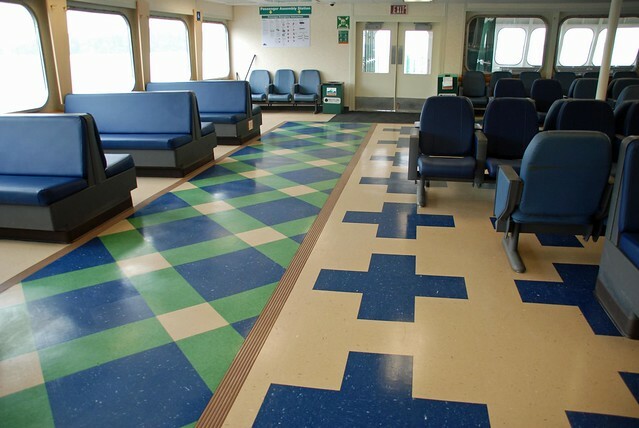 That colour of blue that they use in both the floor and the seats looks suspiciously like BC Ferries blue... just a coincidence? The class boat, the Issaquah, is a regular on the Fauntleroy-Vashon-Southworth rotation, and I was lucky to grab this photo of her leaving the Fauntleroy terminal as we arrived onboard the Klahowya. The day was remarkably clear, considering it was supposed to be raining. 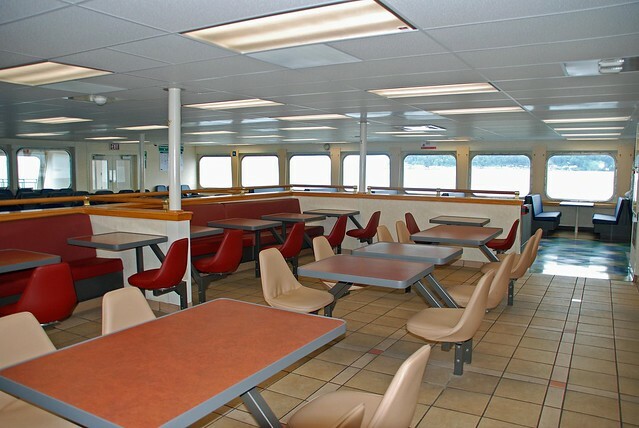 I think I'm going to call the Issaquah "Sealth-aquah" because of the interior. I like vivid colors and patterns on the floor better than the old. I like the newer seats. I like the vending machines on there too. They have the LED lights inside and look cool. I still won't buy from them, they just look cool. And then, there was the Issaquah today, also with the new DOT logo. The rub rail is turning red. Had a chance last night to take a crossing on the Issaquah (was the 12:20AM departure, actually, from Southworth). I'd have to say that after spending a lot of time on the Super Class and the Jumbos, the Issy-class ferries seem to be like tub toys in size comparison. Also grabbed a few of my own photos. I'm still bummed out at the lack of outdoor passenger space on these. They really should've designed more outdoor space on them. I think something funny is going on with the Issaquah. The Klahowya loaded Fauntleroy traffic after Southworth traffic at Vashon. I'm guessing the 14:20 from Vashon to fauntleroy won't go. Yep...the alert is out. "Necessary repairs" have canceled the issaquah's 1420 to fauntleroy.